’Tis the season of the stubtail in Shanghai. Every year in April and May, and again in September and October, birders in Earth’s Greatest City record Asian Stubtail Urosphena squameiceps. 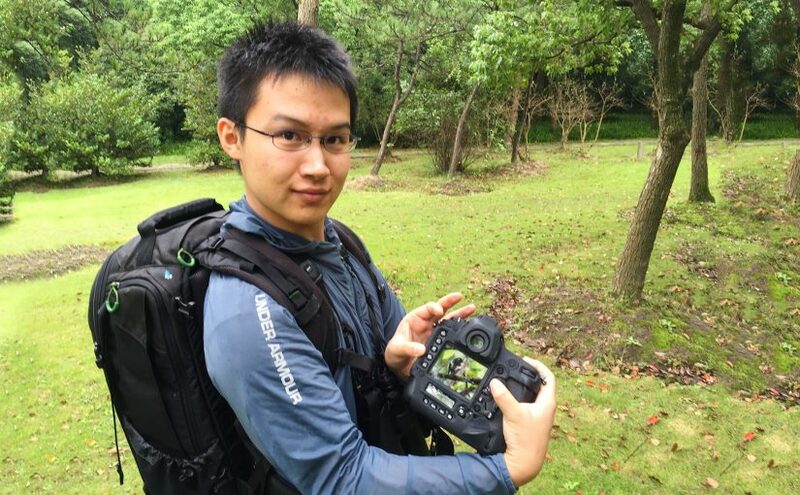 Migrant stubtails are no strangers to the inner city; the photo above, for example, was taken at Changfeng Park, deep in Shanghai’s urban jungle. In Shanghai, most of my records of Asian Stubtail have come from the microforests that dot the sea wall at Cape Nanhui. Migrating stubtails can, however, turn up in any wooded area. In his apartment complex recently, in a wood of about 25 square meters, Shanghai birder Komatsu Yasuhiko found Asian Stubtail. Hiko’s find bears out Kennerley and Pearson: Migrating Asian Stubtail, they write, is “opportunistic and likely to utilise any area of coastal or inland woodland or scrub offering shade and undisturbed areas for feeding” (2010, 557). If Asian Stubtail is seen clearly or photographed well, then one can readily appreciate its distinctiveness. 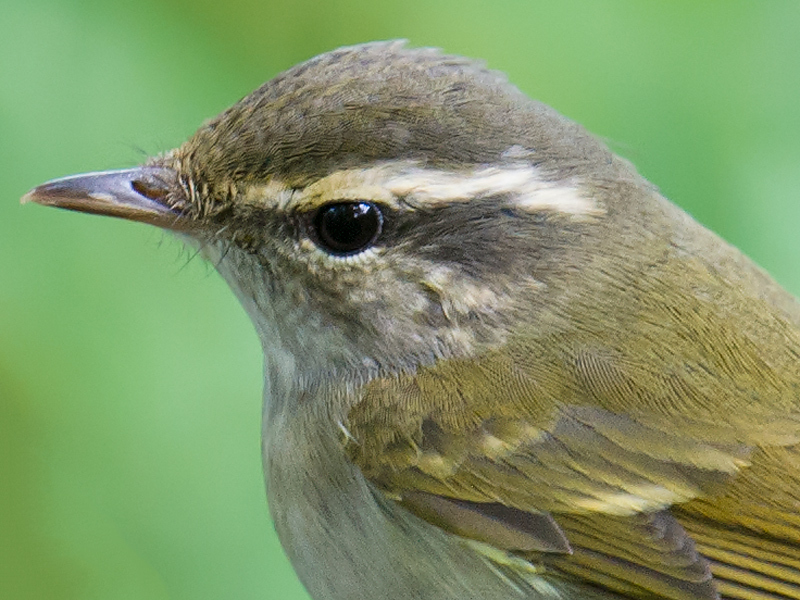 No other warbler in our region has its large-headed, bull-necked, stubby-tailed structure. The long, creamy supercilium is prominent, as is the contrastingly dark eye-line. The bill is fine and pointed, the legs are long and conspicuously pale, and the crown shows faint scaling. Once on Lesser Yangshan, the island hotspot off the coast of Shanghai, I mistook Radde’s Warbler Phylloscopus schwarzi for a stubtail. 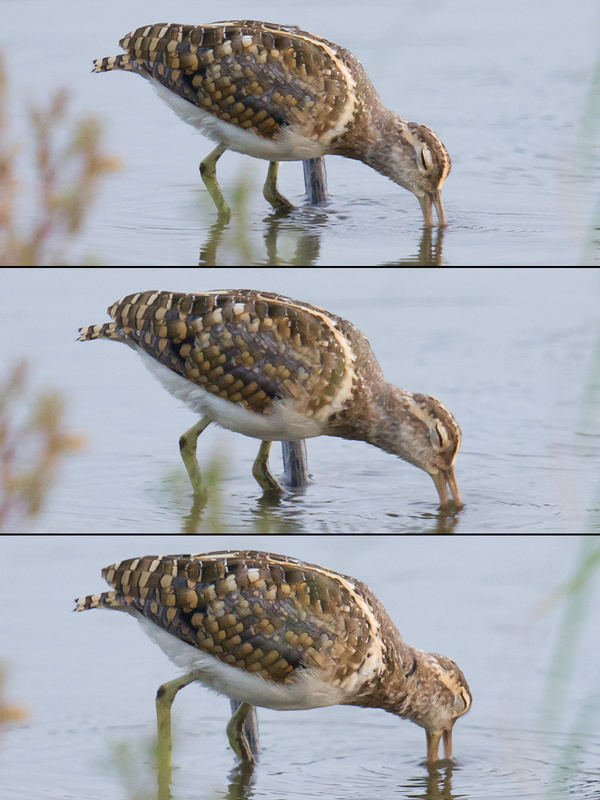 A closer look at my photos revealed the longer tail and spikier bill of the Radde’s. 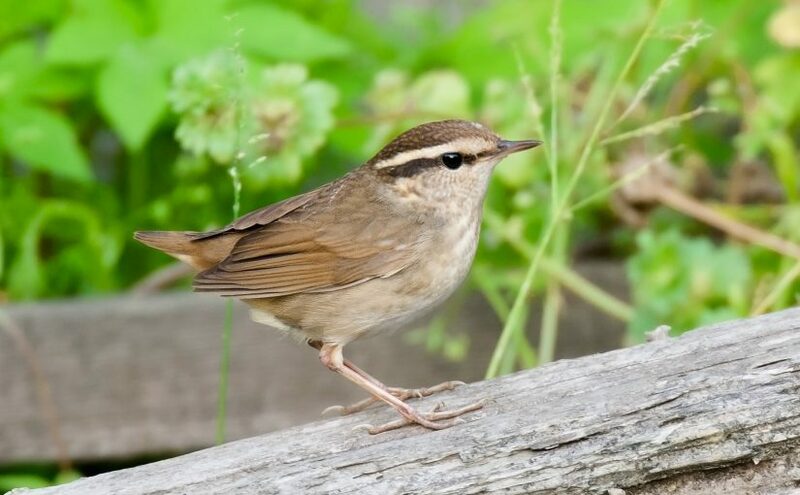 Dusky Warbler P. fuscatus shares the dull, uniform plumage of Asian Stubtail and like the stubtail has a long supercilium, but it has a longer tail and shorter bill. 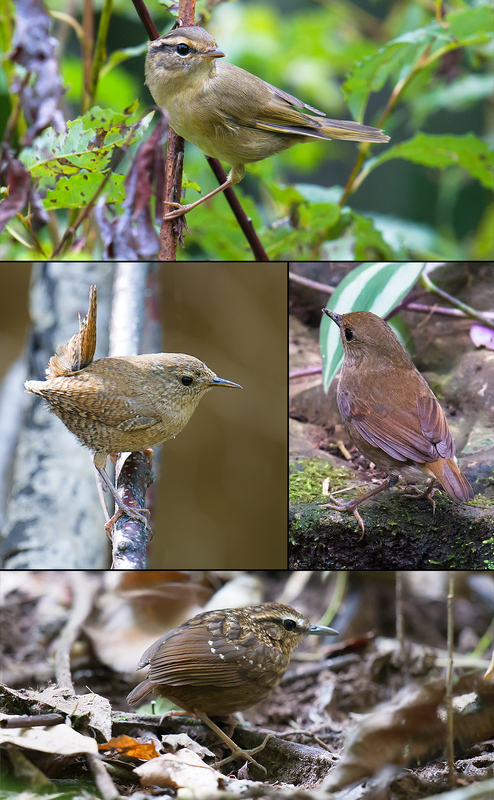 Observers of Asian Stubtail in its winter range must separate it from shortwings and wren-babblers, while viewers of the species in its breeding range need to distinguish it from Eurasian Wren Troglodytes troglodytes (Kennerley & Pearson 2010, 556). A common passage migrant in Shanghai, Asian Stubtail breeds in Beijing, Hebei, and Northeast China and adjacent Ussuriland as well as southern Sakhalin Island, the four main islands of Japan, and the Korean Peninsula. The winter range includes Guangdong, Hainan, and Guangxi and much of Southeast Asia (Holt in litt., 2019; Brazil 2009, 340; Kennerley & Pearson 2010, 557). 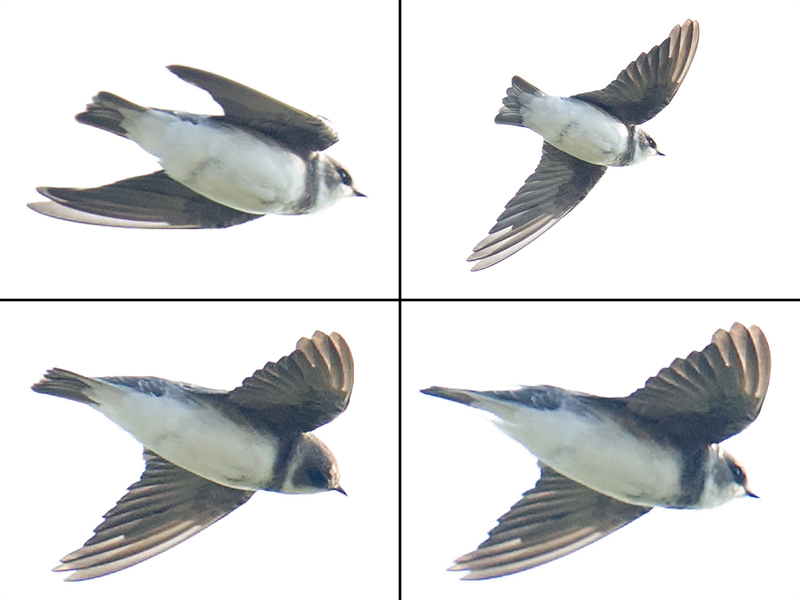 I have noted breeding Asian Stubtail in Heilongjiang and Hebei (10 June), migrating Asian Stubtail in Jiangsu and Shanghai, and a possibly wintering Asian Stubtail on 15 Nov. 2014 at Wuyuan, Jiangxi. Regarding the Jiangxi record, the presence of the species in mid-November at that latitude (29.2142, 117.5626) is surprising but not inconceivable; Brazil (2018, 290) reports that some Asian Stubtail winter in southern Kyushu, which is farther north than Jiangxi. 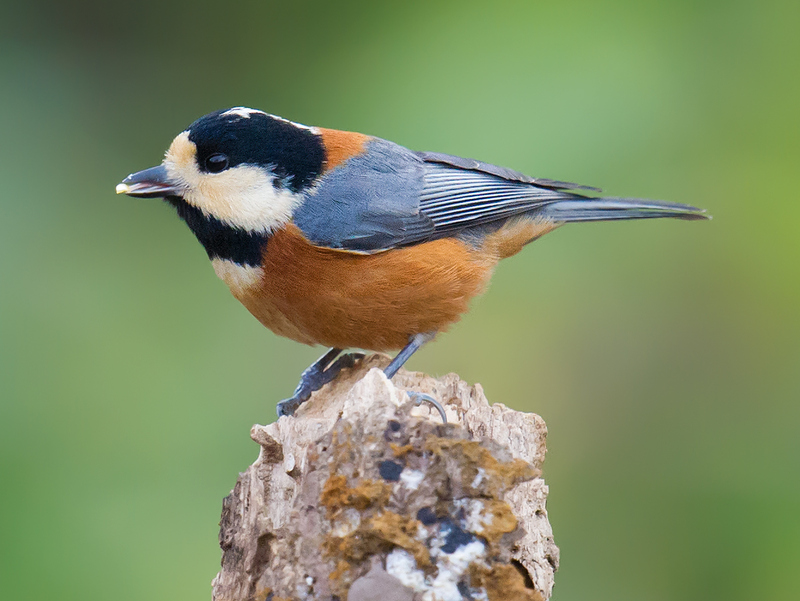 The Wuyuan stubtail was singing intermittently; the best explanation may be that it was a first-winter bird. Brazil, M. (2009). 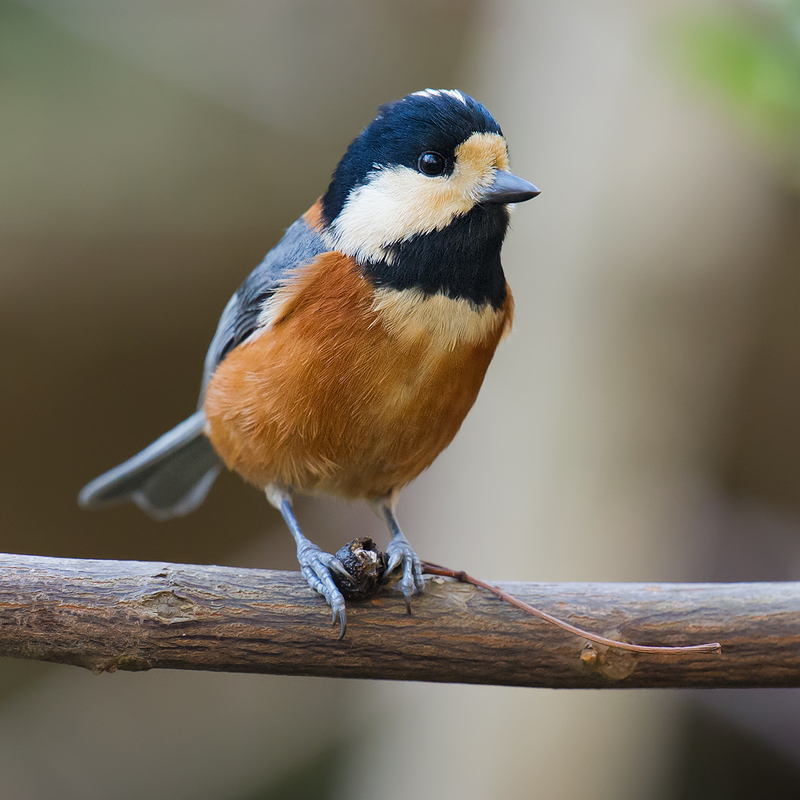 Birds of East Asia. Princeton, New Jersey: Princeton University Press. Brazil, M. (2018). Birds of Japan. London: Bloomsbury Publishing. Brelsford, C. (2017). Gansu Bluetail, Wulingshan, Hebei (https://www.shanghaibirding.com/2017/06/17/gansu-bluetail/). 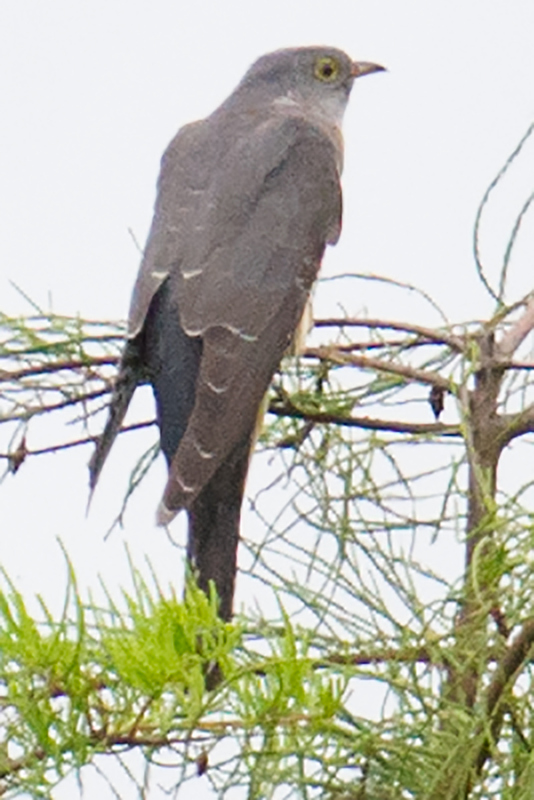 Post to shanghaibirding.com, published 17 June 2017 (accessed: 19 April 2019). Brelsford, C. & Du, E. (2014). Wuyuan & Poyang Lake, November 2014 (https://www.shanghaibirding.com/explorations/wuyuan-2014/). 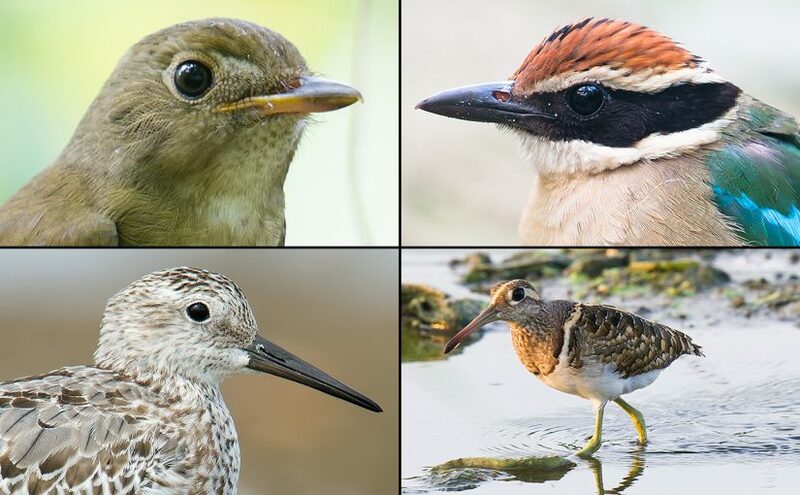 Report on shanghaibirding.com (accessed: 19 April 2019). Brelsford, C. & Du, E. (2015). Inner Mongolia & Heilongjiang, 2015: Part 4: Second Trip to Elaine’s Hometown (https://www.shanghaibirding.com/explorations/inner-mongolia-heilongjiang/part4/). 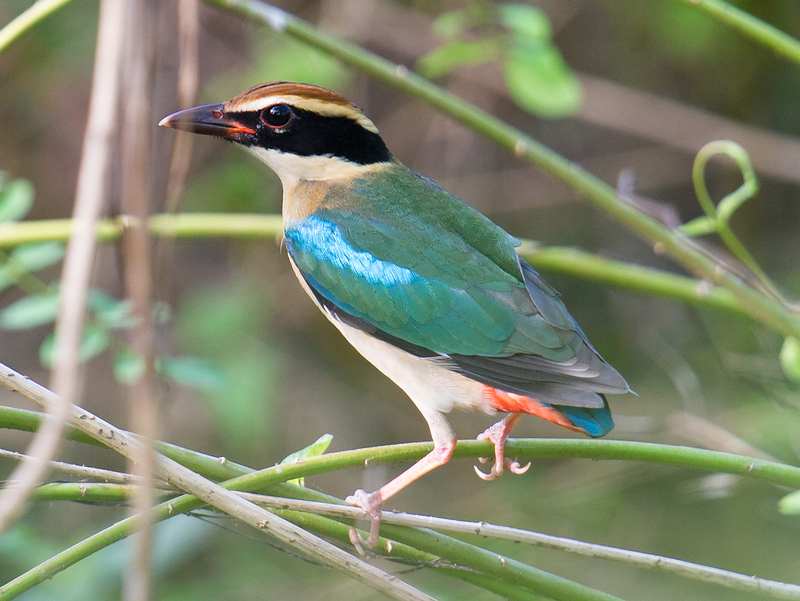 Report on shanghaibirding.com (accessed: 19 April 2019). Brelsford, C. & Du, E. (2016). 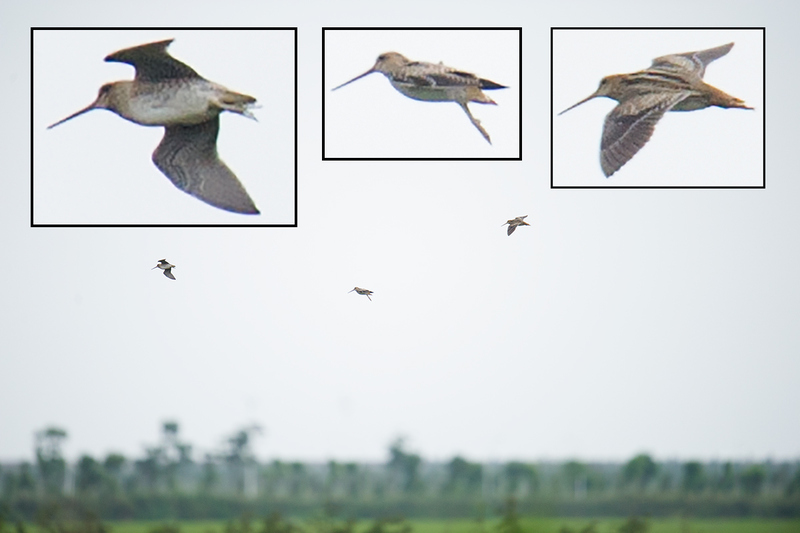 Boli, Heilongjiang, May-June 2016 (https://www.shanghaibirding.com/explorations/boli-may-june-2016/). 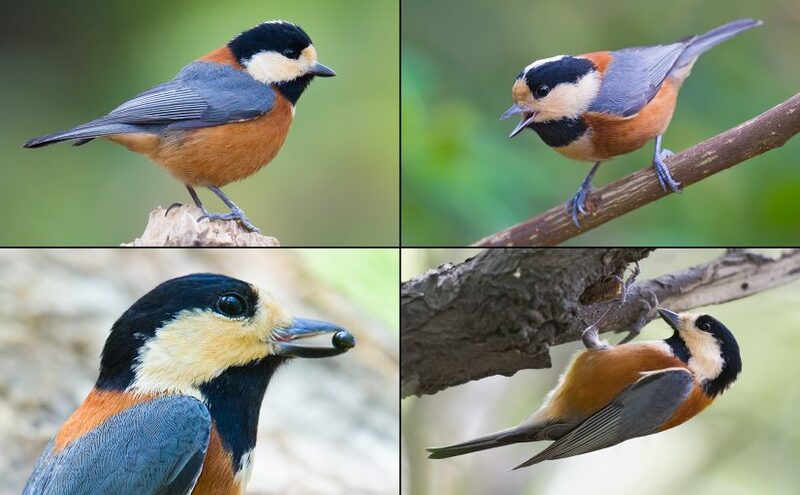 Report on shanghaibirding.com (accessed: 19 April 2019). Clement, P. (2006). Family Sylviidae (Old World Warblers). P. 588 (Asian Stubtail) in del Hoyo, J., Elliott, A. & Christie, D.A. eds. (2006). Handbook of the Birds of the World. Vol. 11. 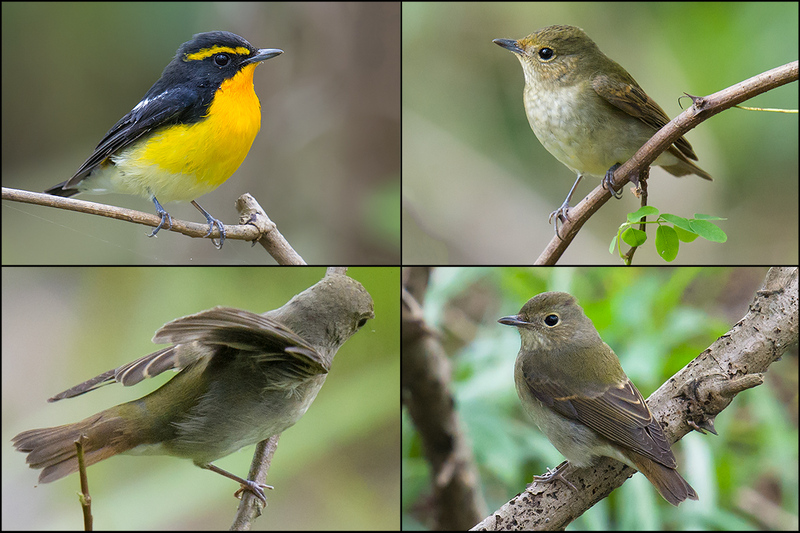 Old World Flycatchers to Old World Warblers. Lynx Edicions, Barcelona, Spain. Holt, P. (2019). Series of text messages between Holt and author, 20 April. Kennerley, P. & Pearson, D. (2010). Reed and Bush Warblers. London: Christopher Helm. 1. On 22 April 2019, Beijing added to breeding range of Asian Stubtail, Paul Holt added to bibliography. 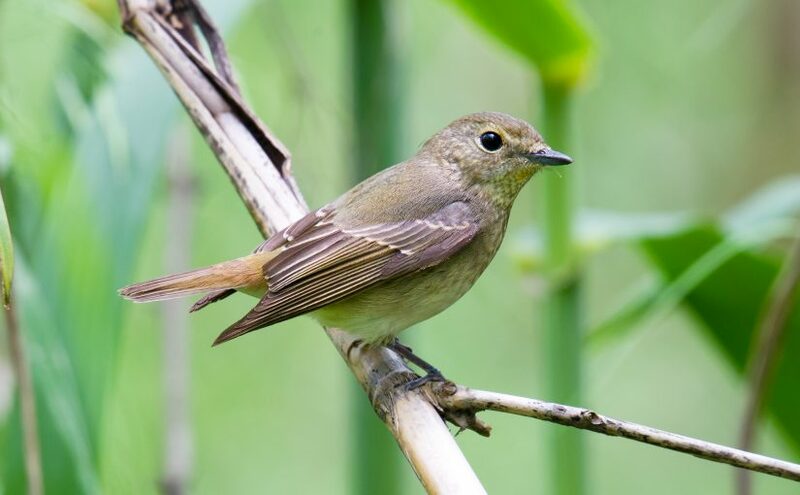 Does Green-backed Flycatcher Ficedula elisae migrate through Shanghai? 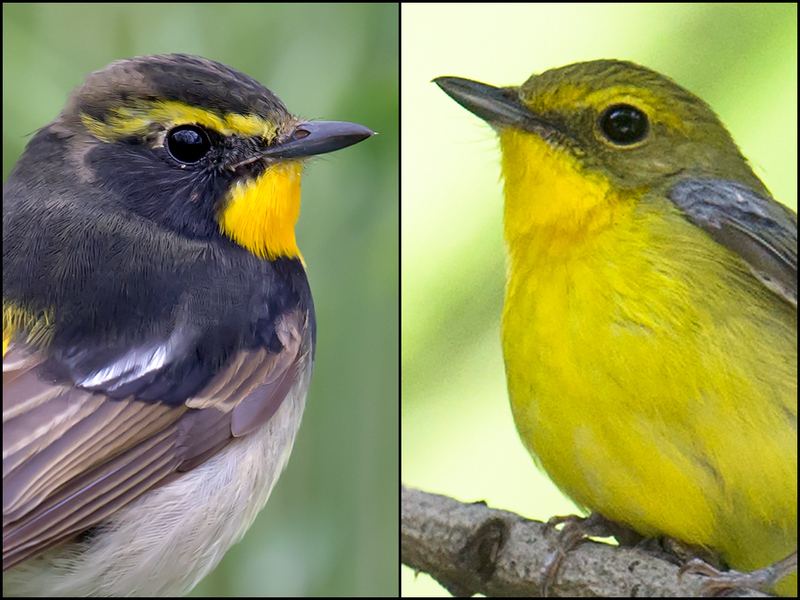 Records exist of the species, but in my opinion they are mainly misidentifications of female Narcissus Flycatcher F. narcissina narcissina (above). In this post, I am going to unearth the roots of my skepticism about F. elisae in Shanghai and describe the differences between female F. elisae and female F. n. narcissina. 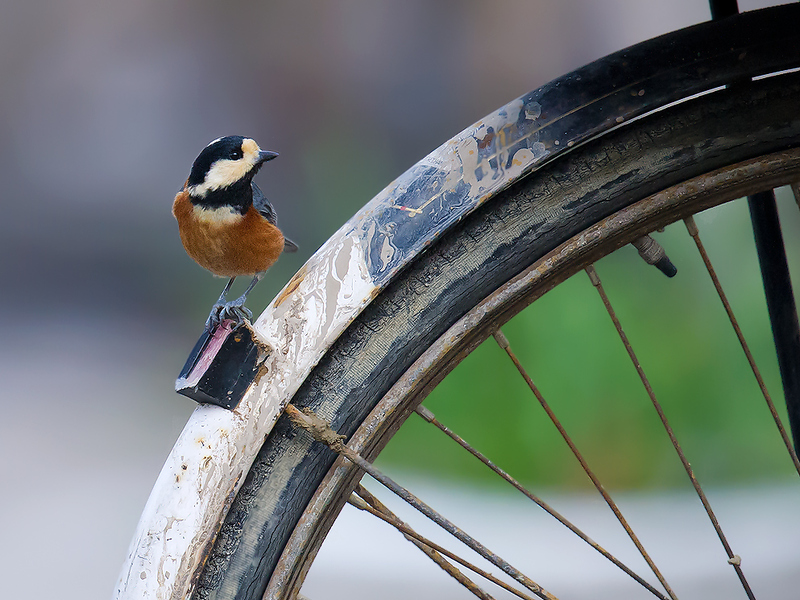 Each spring and autumn, birders in Earth’s Greatest City claim records of elisae. 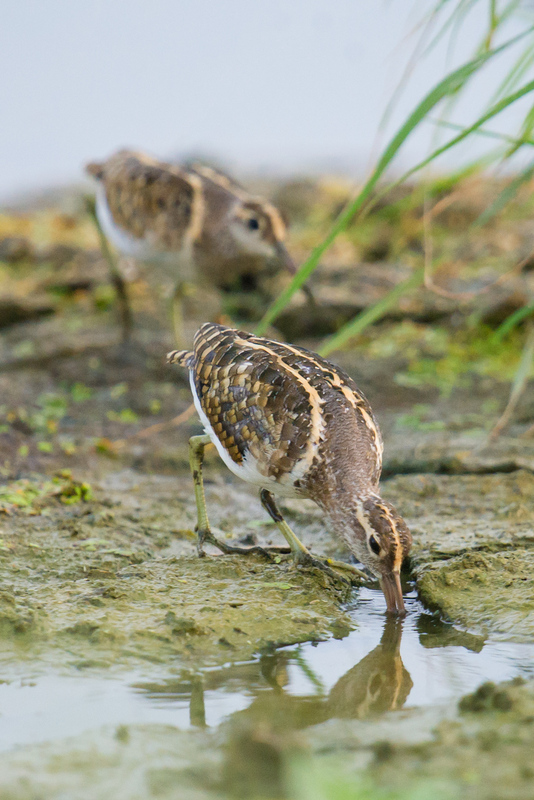 Invariably, the bird in question is a female, not the very distinctive adult male. 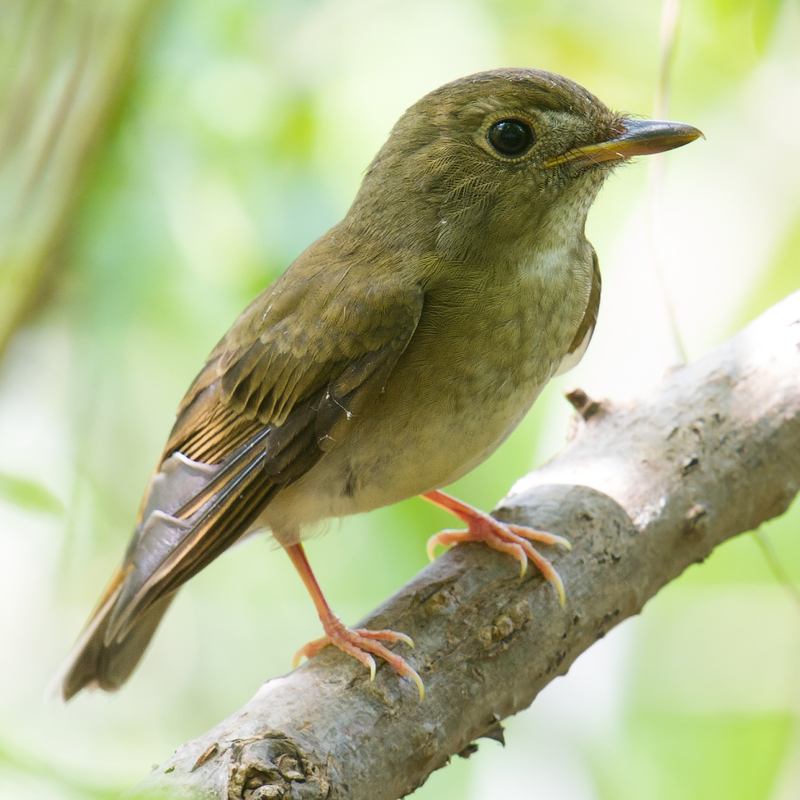 Here our first red flag pops up: How likely is it that elisae is the one species of passerine whose records in Shanghai never involve adult males? For the sake of argument, let us admit the possibility of an all-female migration of elisae through Shanghai. Fine, I retort; then show me photos of these purported elisae. The photos are duly supplied, and again and again, as has been the case throughout my more than 10 years in Shanghai, the supposed F. elisae is revealed on closer scrutiny to be yet another female F. n. narcissina. 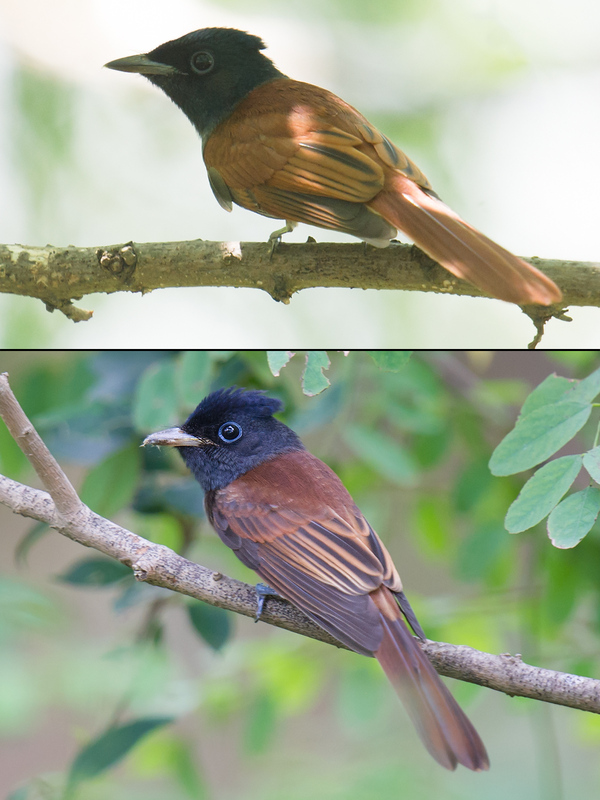 Indeed, I have seen better documentation in Shanghai of Ryukyu Flycatcher F. (narcissina) owstoni than of F. elisae; on 17 April 2016 at Pudong’s Binjiang Forest Park, Shanghai birder Zhang Xiaolei got a very interesting picture of a possible adult-male owstoni. 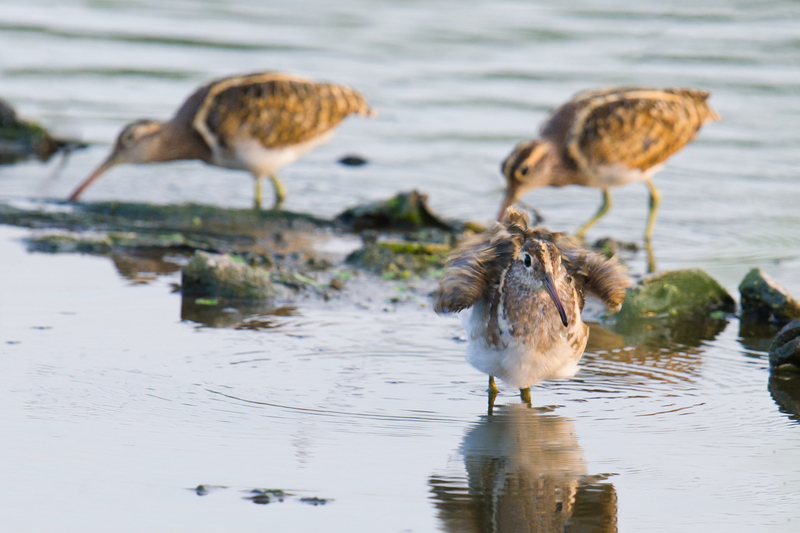 Mistakes of the sort many Shanghai birders are making contribute to a distorted picture of the presence on the central Chinese coast of a little-known species. What’s more, the mistakes are avoidable. Separation of female F. elisae and F. n. narcissina is usually straightforward. Female F. elisae has greenish upperparts with a yellowish or olive tint. Female F. n. narcissina is greenish with a brownish tint, like female Blue-and-white Flycatcher Cyanoptila cyanomelana (above). 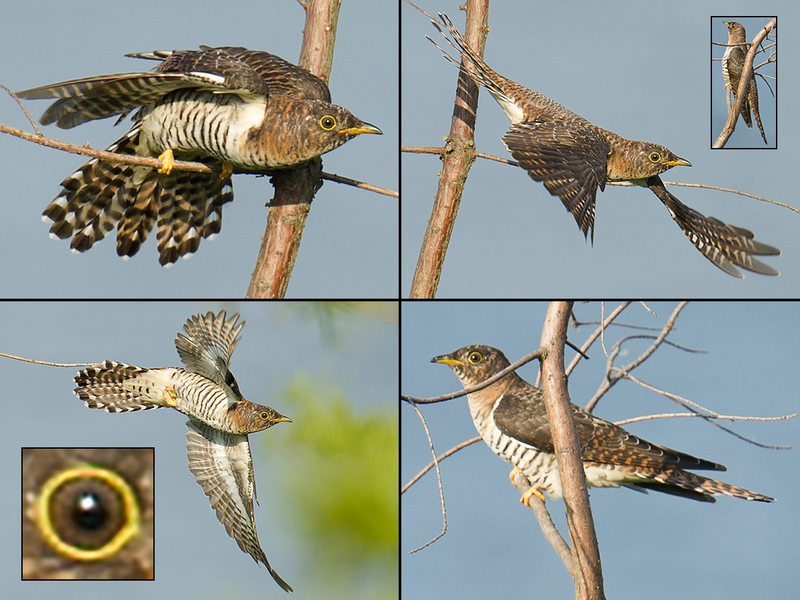 On their underparts, female F. elisae is “dull yellow or yellowish-buff,” while F. n. narcissina is mainly off-white, with brownish-white flanks and a hint of yellow on the throat and belly (Brazil 2009, 436). We can say, therefore, that unlike Pale-legged Leaf Warbler and Sakhalin Leaf Warbler, female F. elisae and F. n. narcissina are distinguishable by plumage. A good look or good photo will likely lead to an accurate ID. 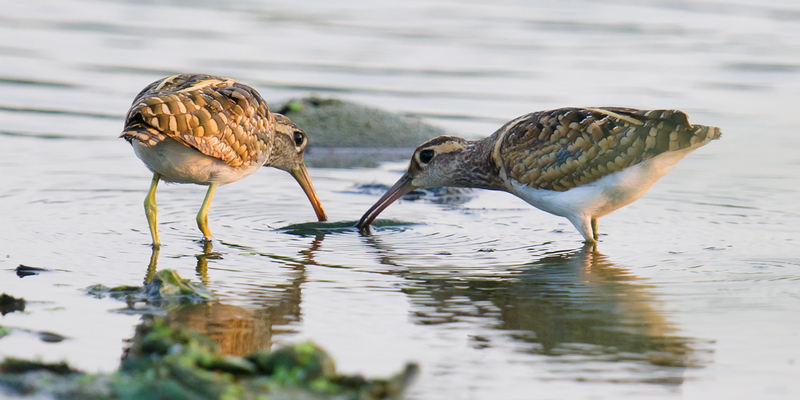 Accurate records in Shanghai, one of the most thoroughly birded areas on the Chinese coast, will lead to better understandings of both F. elisae and F. n. narcissina. Already, the growing body of knowledge about these East Asian breeding endemics has led to the separation of F. elisae and F. n. narcissina into separate species. 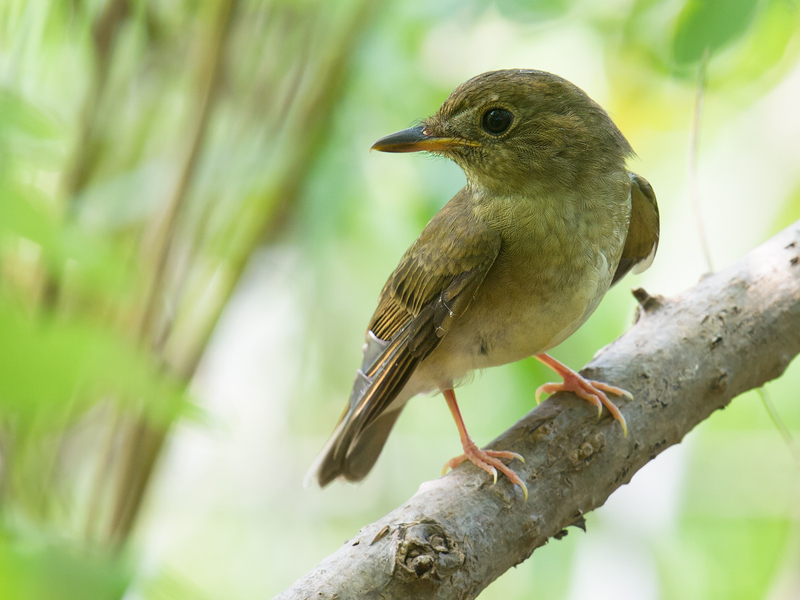 Previously, elisae had been treated as a subspecies of Narcissus Flycatcher. 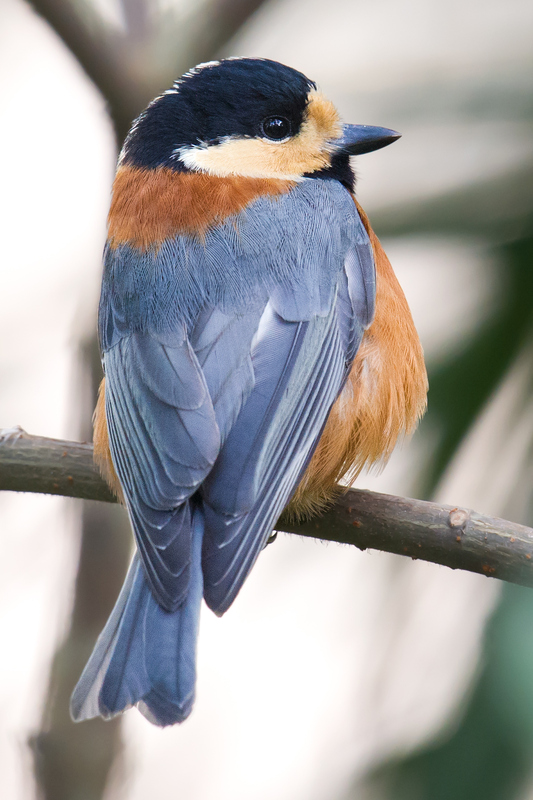 We know as well that the summer and winter ranges of the sister species are disjunct, with F. elisae breeding in a very compact range in Hebei (Wulingshan), Beijing, and Shanxi and wintering in southern Thailand and Peninsular Malaysia. The breeding range of F. n. narcissina includes the main islands of Japan as well as the Kuril Islands, Sakhalin, and the coastal Russian Far East. The species winters in Hainan, the Philippines, and Borneo and passes through Shanghai each spring from about 15 April to 15 May. 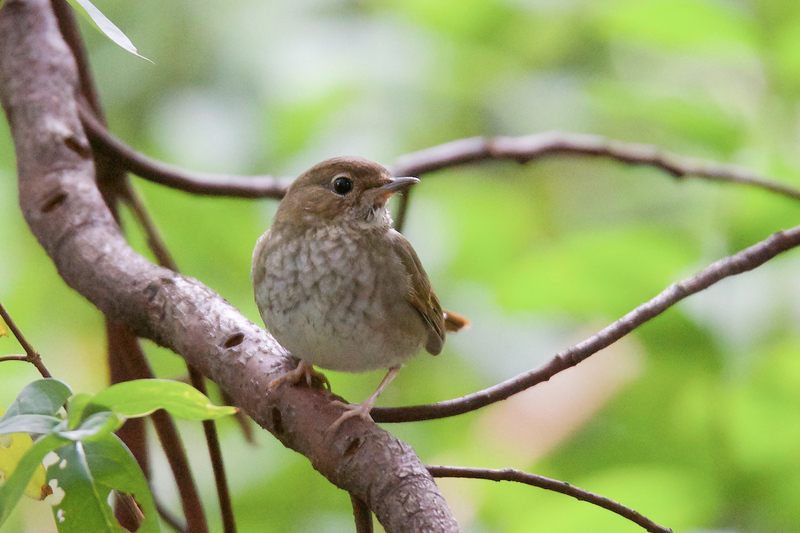 Unlike other passage-migrant flycatchers in Shanghai, F. n. narcissina is much less common in autumn than in spring. 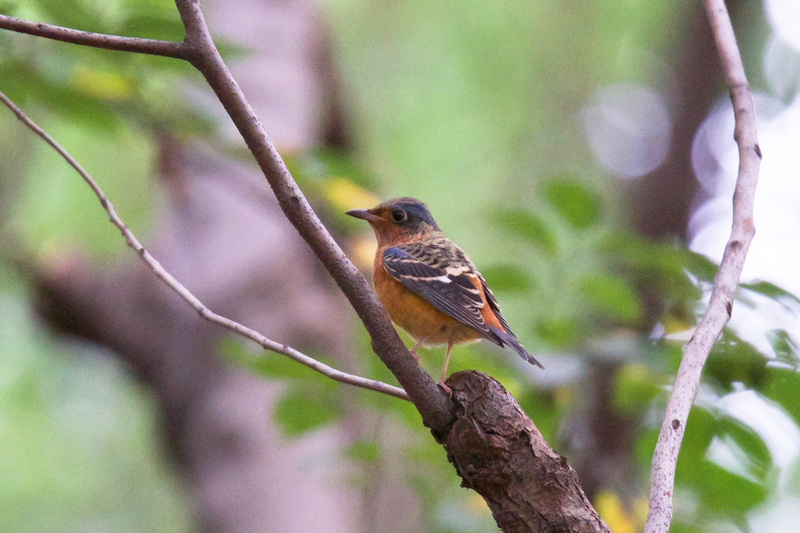 That is a mystery, one of many surrounding the migration of the Narcissus Flycatcher group. In light of the information deficit, it behooves us Shanghai birders to strive for accurate records (or non-records) of elisae in our region. Let us practice self-discipline, hone our skills, and give outside observers the clearest possible picture of bird migration in Shanghai. Brazil, Mark. 2009. 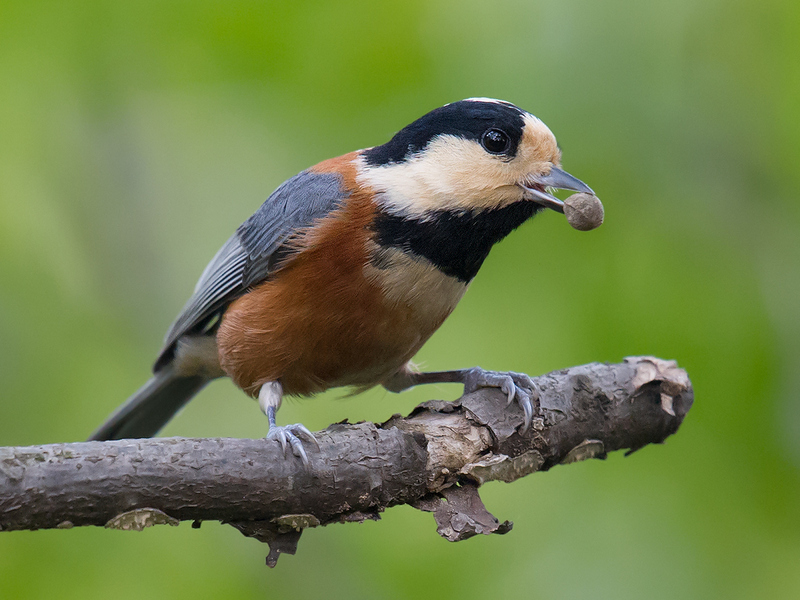 Birds of East Asia. Princeton, New Jersey: Princeton University Press. Entries for Narcissus Flycatcher and Chinese Flycatcher (Ficedula elisae), p. 436. Gill, F & D Donsker (Eds). 2019. IOC World Bird List (v 7.3). shanghaibirding.com’s first reference for taxonomy as well as bird names in English. Accessed 23 April 2019. Oriental Bird Images (orientalbirdimages.org). 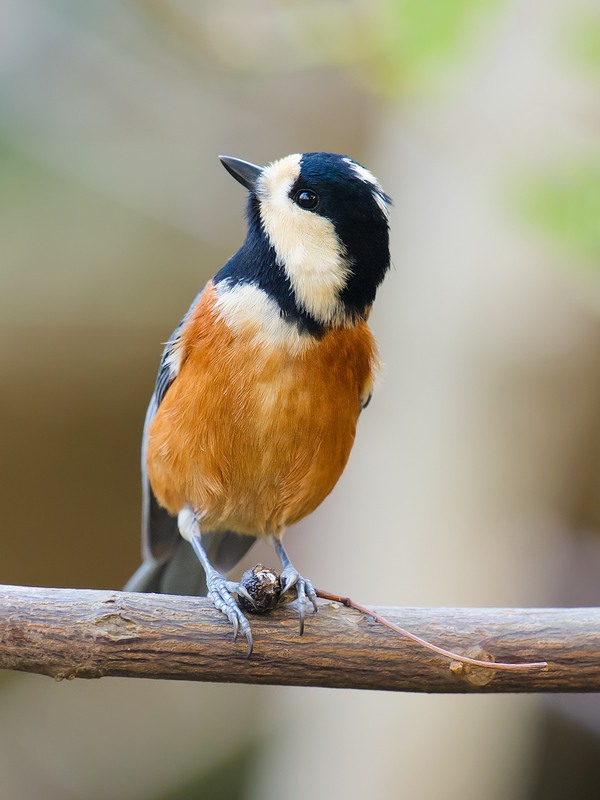 “Narcissus Flycatcher Ficedula narcissina elisae – Female.” Accessed 23 April 2019. ———. “Narcissus Flycatcher Ficedula narcissina elisae – Female.” Accessed 23 April 2019. ​Century Park, Pudong, Thurs. 5 Oct. 2017, Komatsu Yasuhiko and Craig Brelsford, 39 species. Hiko and I blew past our target of 35 species and added three species to the shanghaibirding.com Century Park all-time bird list. The total now stands at 138 species. Hiko and I added five species to the eBird Century Park all-time list, bringing the total to 117. 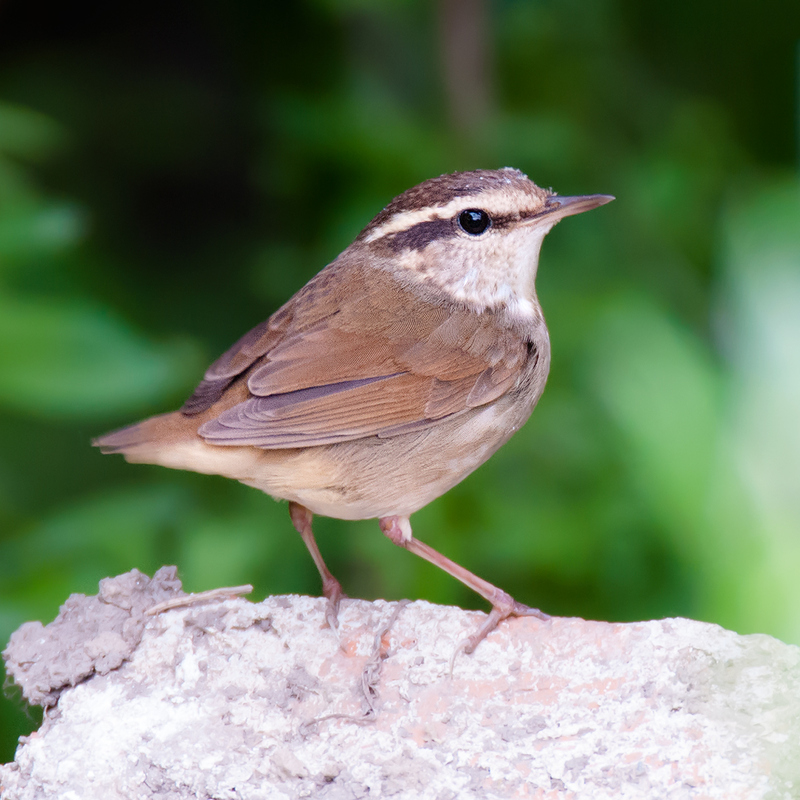 The new entries on the shanghaibirding.com list are Sakhalin Leaf Warbler, Dusky Warbler, and White-throated Rock Thrush. The new entries on the eBird list are those three plus Japanese Paradise Flycatcher and Taiga Flycatcher. “Century Park is getting better,” Hiko said. My young friend is right. Century Park is an island of stability amid the sea of change (mainly degradation) that is the natural environment of Shanghai. Ten years ago this month, when Hiko was a tyke of 6, I made my first visit to urban Shanghai’s best birding area. Little has changed. The biggest difference between October 2007 and October 2017 is, the trees are taller. The wooded areas at Century have an ever-stronger woodsy feel. — Century yielded yet another regional record of Sakhalin Leaf Warbler. 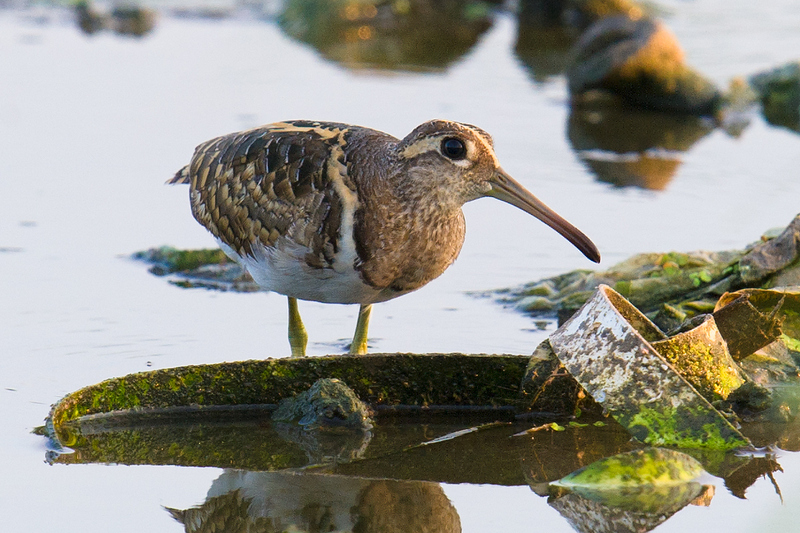 Evidence is growing that in the Shanghai area this passage migrant has been neglected and is more common than previously thought. 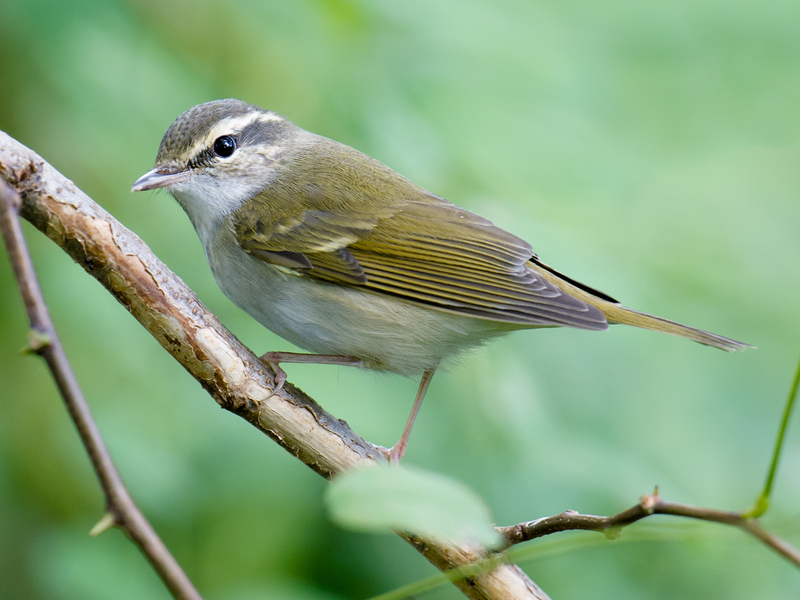 I recently wrote a series of posts, the latest being this one, on distinguishing Sakhalin Leaf Warbler from its sister species Pale-legged Leaf Warbler. 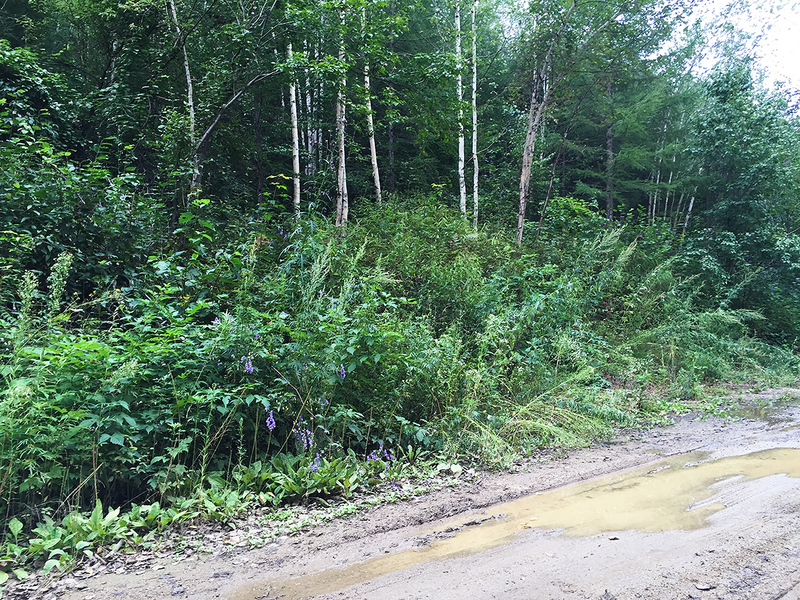 Here is the recording I made of the calling Sakhalin on Thurs. 5 Oct. Apart from a DNA assay, call as well as song is the only reliable way to separate Sakhalin Leaf Warbler from Pale-legged Leaf Warbler. At 4.9 kHz, the “tink” recorded below is a full kilohertz deeper than the call of Pale-legged Leaf Warbler. — Eurasian Woodcock whizzed overhead on its way to Bird Island (31.217405, 121.554936). The woodcock was going to the one best place for it in the urban park. Bird Island, Century’s sanctuary-within-a-sanctuary, is a bird-friendly, cat-free parcel of woodland cut off from the rest of the park by a moat. — Great Spotted Woodpecker used to be found mainly on Bird Island. On Thursday we found 2 in other sectors of the park. With the steadily improving woodland in the park, expect Great Spotted Woodpecker to be seen in more and more areas. 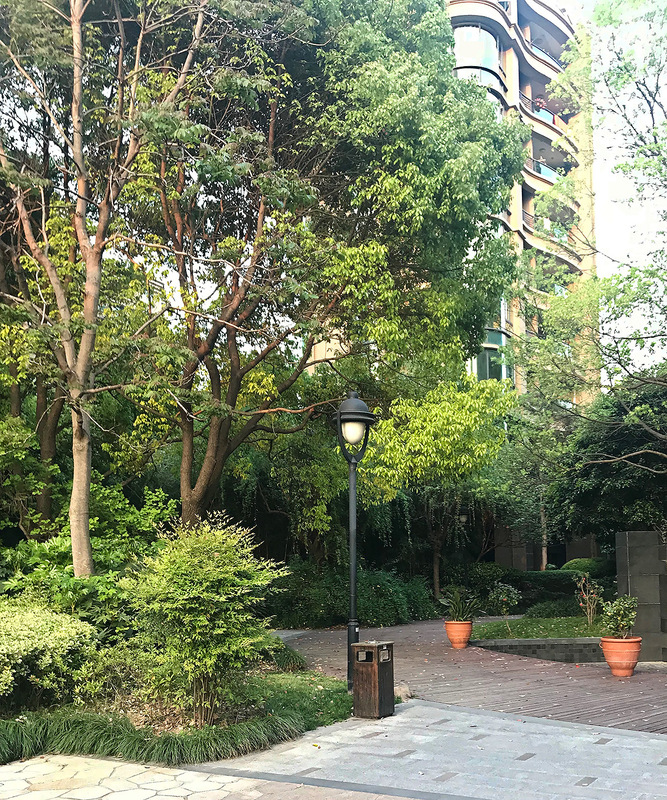 Century Park is one of the few areas in urban Shanghai where woodpeckers are commonly found. — Arctic Warbler 9 calling. No evidence Thursday of Kamchatka Leaf Warbler. — Rufous-tailed Robin in undergrowth, ID’d quickly and accurately by Hiko. 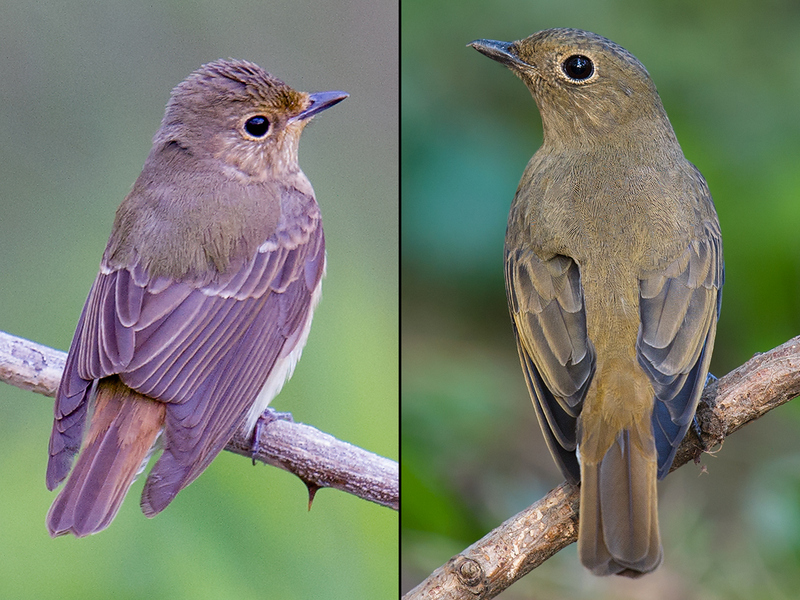 — Red-flanked Bluetail, Grey-backed Thrush: common winter visitors to Shanghai and seasonal firsts for Hiko and me. — White’s Thrush: a healthy 11 taking advantage of the high-quality woodland in the park. On Sun. 17 Sept. 2017 at Pudong’s Cape Nanhui, I achieved a personal first: photos of an unmistakable Sakhalin Leaf Warbler Phylloscopus borealoides. As expected, the photos show a leaf warbler whose plumage and bare parts are virtually indistinguishable from those of Pale-legged Leaf Warbler P. tenellipes. 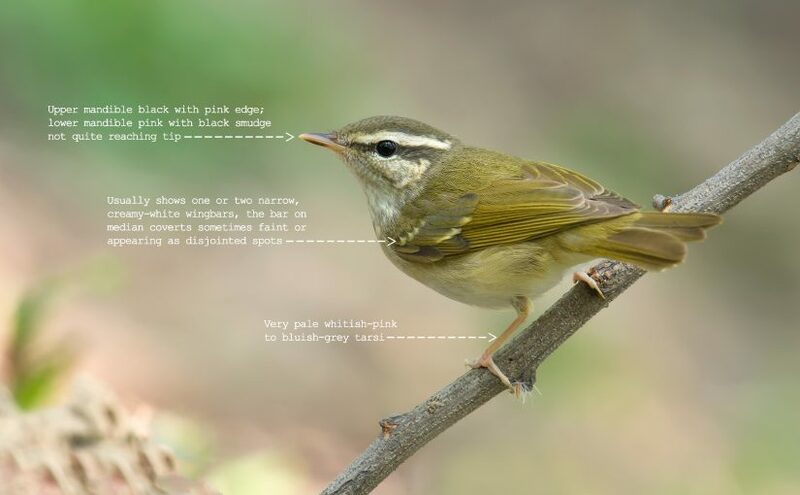 Coupled, however, as they are with sound-recordings of the same individual, ensuring the ID, the photos constitute a rare visual record of Sakhalin Leaf Warbler in Shanghai. The leaf warbler I found was easily identifiable as a member of the Pale-Sak species pair. It had strikingly pale pink tarsi, an olive-brown crown contrasting with olive-green mantle and wings, a long and creamy supercilium, and faint wing bars on the median and greater coverts. 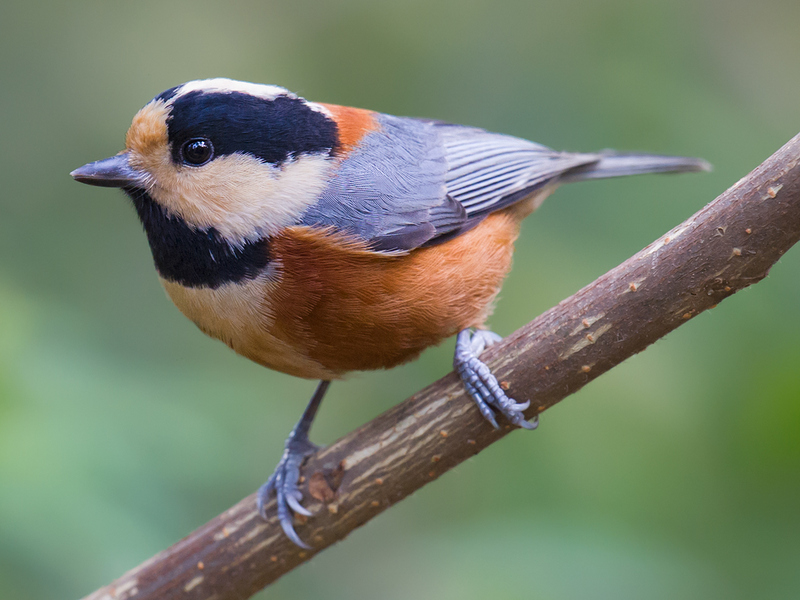 The bird, which was in Microforest 1, behaved in a way typical of the Pale-Saks I have observed in the Cape Nanhui microforests, eight tiny woodlands that dot the coastline of the cape. 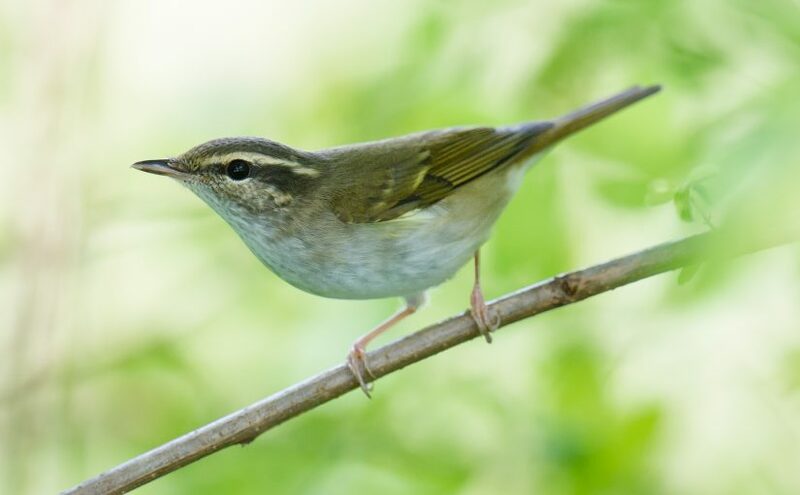 Rarely venturing more than 2 m off the ground, the leaf warbler favored low branches and vines for browsing and sturdy low branches for perching. It pumped its tail steadily, called spontaneously, and upon hearing playback of its own call moved in to investigate the source. The most convenient separator of Pale-Sak is song, the cricket-like trill of Pale-legged being easily separable from the metallic whistle of Sakhalin. 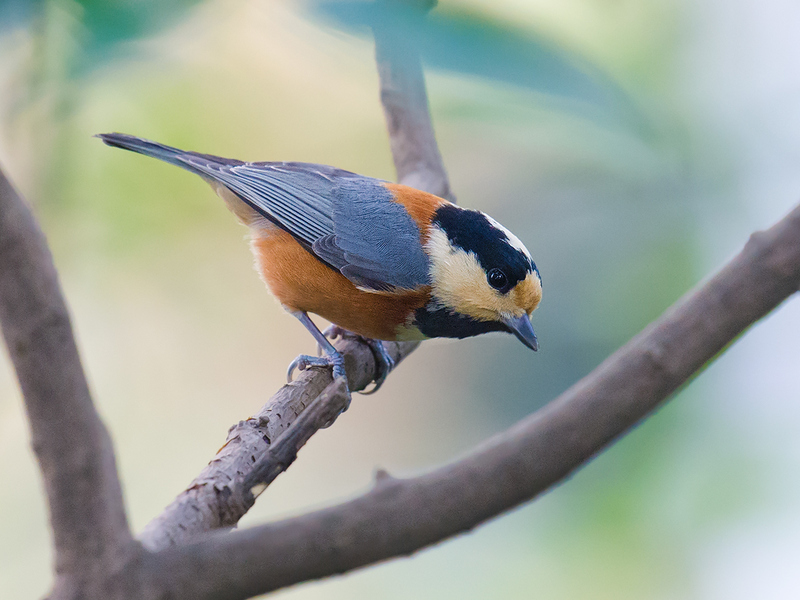 As Shanghai is not in the breeding range of either species, Pale-Sak songs are not often heard in Earth’s Greatest City. I have heard Sakhalin sing only once, on 5 May 2016 at Shanghai’s Zhongshan Park (Brelsford 2016). The song of Pale-legged I have heard at various locations in Shanghai as well as on its breeding grounds in Heilongjiang (Brelsford & Du 2017). Although not as readily distinguishable as the songs, the “tink” calls of Pale-Sak differ markedly and consistently and are a reliable basis for an ID (Yap et al. 2014; Round et al. 2016; Weprincew et al. 1989). Yap et al. say the call of Pale-legged is of a “consistently higher frequency” than the call of Sakhalin. The calls that I have recorded of the two species show a difference in frequency of about 1 kHz, very much in line with others’ findings (Brelsford, August 2017; Brelsford, September 2017). 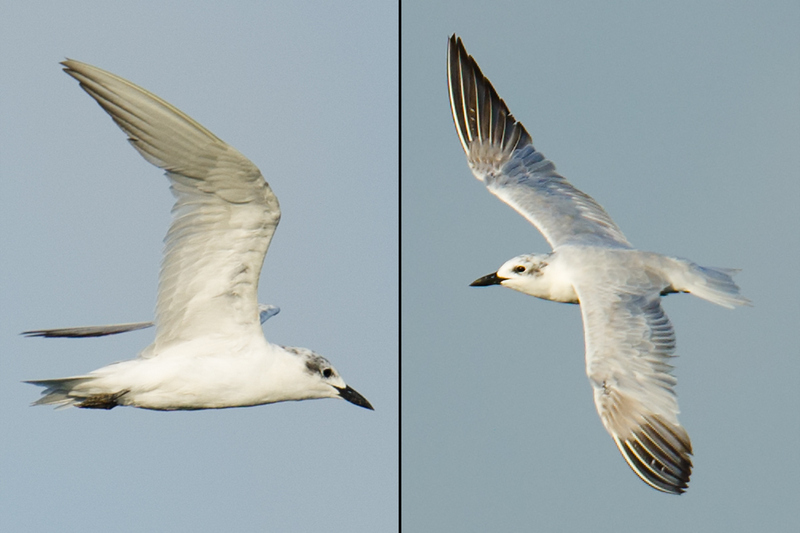 For birders unaccustomed to Pale-Sak calls, the difference may be hard to detect, especially at windy Cape Nanhui. A sound-recorder (which may be a smartphone) will pick up the difference, and an audio spectrogram will show it graphically. Solid, indisputable ticks, in some cases life ticks, await enterprising birders who sound-record. In recent months, my work with sound-recordings has helped give Shanghai birders a clearer picture not only of Sakhalin Leaf Warbler but also of Kamchatka Leaf Warbler Phylloscopus examinandus, like Sakhalin a poorly known passage migrant through Shanghai (Brelsford, June 2017). In the case of Pale-Sak in Shanghai, a picture is emerging of overlapping migratory pathways. This finding comports with the findings of Yap et al. at Beidaihe, a thousand kilometers to the north. 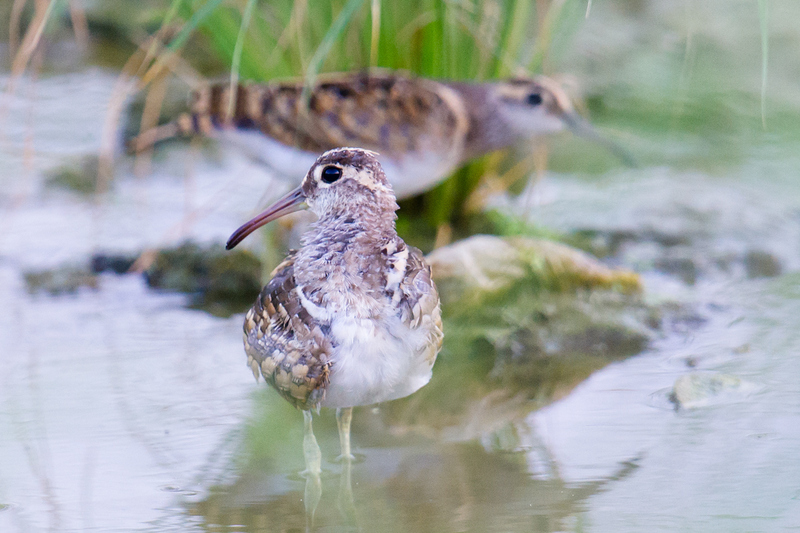 After analyzing calls obtained at Beidaihe of both Pale-legged and Sakhalin, Yap hypothesizes that in coastal Hebei “the migratory pathways of the two sister species may largely overlap” (2014). How extensive is the Pale-Sak migratory overlap in Shanghai? How many of the Pale-Saks that we find in Shanghai each spring and autumn are Pale-legged, and how many are Sakhalin? Is there a peak passage time in Shanghai for each species, and if so, when is it? Answers to these questions are currently unknown, but they are probably knowable, and it is very much possible for the citizen-scientists of Shanghai to be the producers of that knowledge. We only need to change our habits. When it comes to identifying lookalike species such as Pale-legged and Sakhalin Leaf Warbler, birders need to understand that photos do nothing to cut through the muddle. Only sound-recordings lead to indisputable records and a clearer picture of the species in Shanghai. 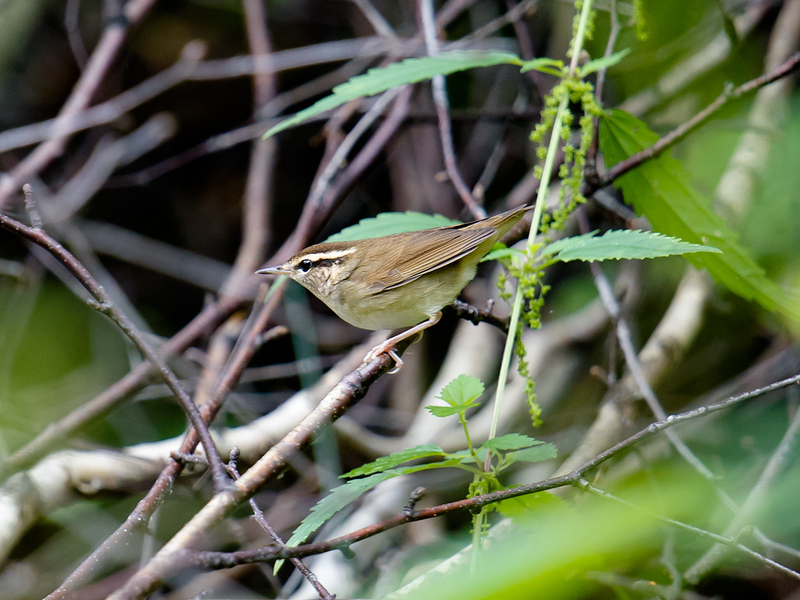 A clearer picture will add to our knowledge of the movement of leaf warblers along the central Chinese coast, focus attention on little-known East Asian species, and heighten the allure of Shanghai as a world-class birding location. 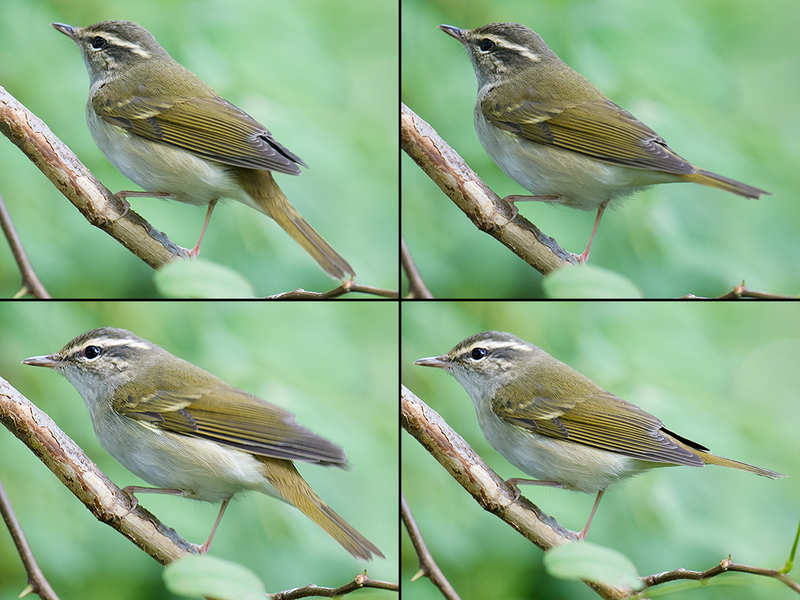 The sound-recordings and audio spectrograms below show clearly the difference in frequency between the calls of Sakhalin and Pale-legged Leaf Warbler. Here are photos of the Sakhalin Leaf Warbler of 17 Sept. 2017. The bird below is the same individual whose voice I sound-recorded. Brelsford, Craig. Sakhalin & Pale-legged Leaf Warbler, Singing Together. 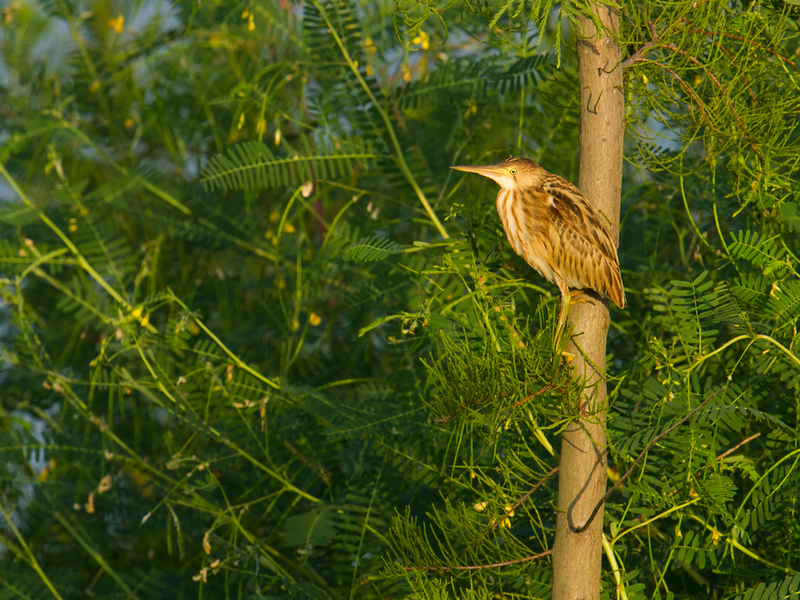 Post to shanghaibirding.com published 5 May 2016 (accessed: 12 April 2019). ———. Kamchatka Leaf Warbler in Shanghai. 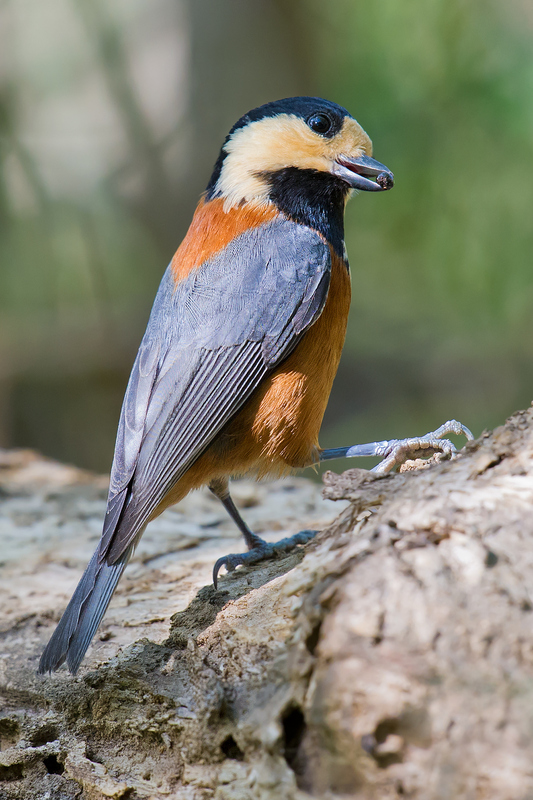 Post to shanghaibirding.com published 6 June 2017 (accessed: 12 April 2019). ———. Separating Pale-legged & Sakhalin Leaf Warbler on Call. 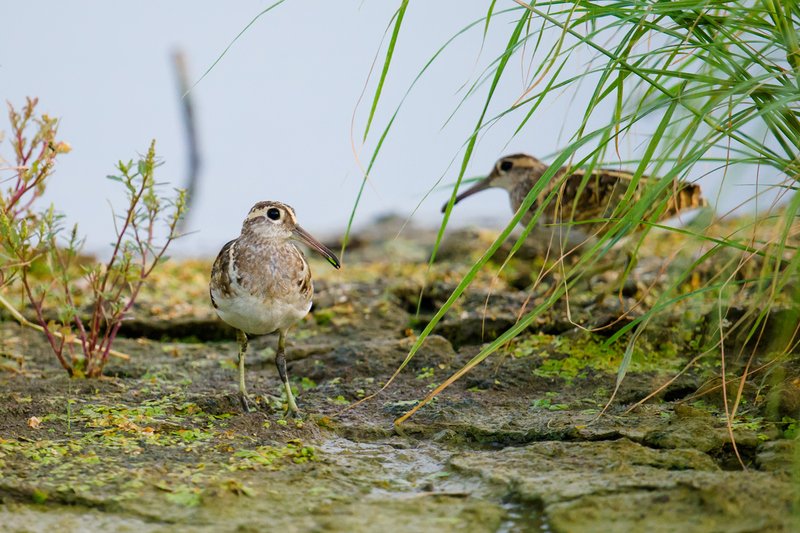 Post to shanghaibirding.com published 31 Aug. 2017 (accessed: 12 April 2019). ———. Pale-Sak Calls: An Addendum. 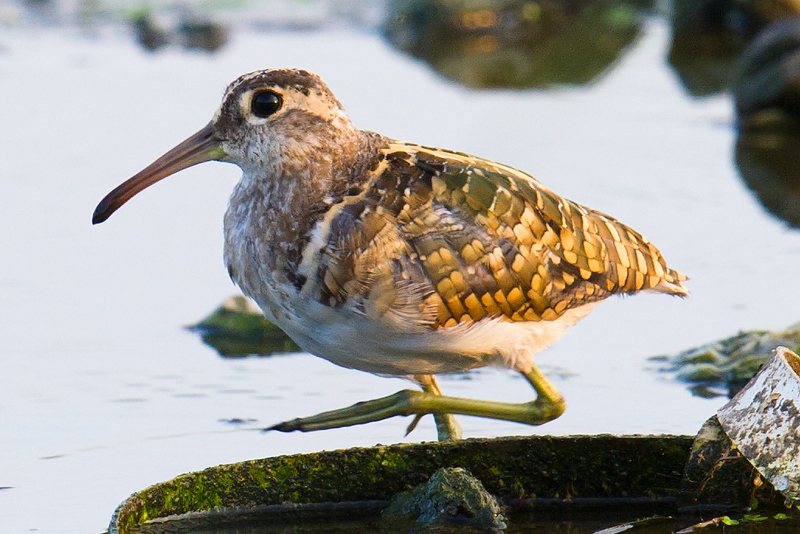 Post to shanghaibirding.com published 10 Sept. 2017 (accessed: 12 April 2019). Brelsford, Craig, & Du, Elaine. Boli County, Heilongjiang, May-June 2016: Part 1. 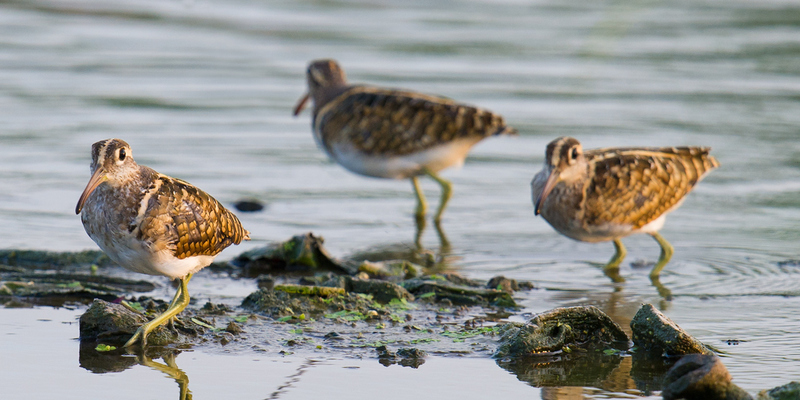 Page on shanghaibirding.com (accessed: 12 April 2019). Round, Philip D. E-mail message to Craig Brelsford, 18 Oct. 2016. 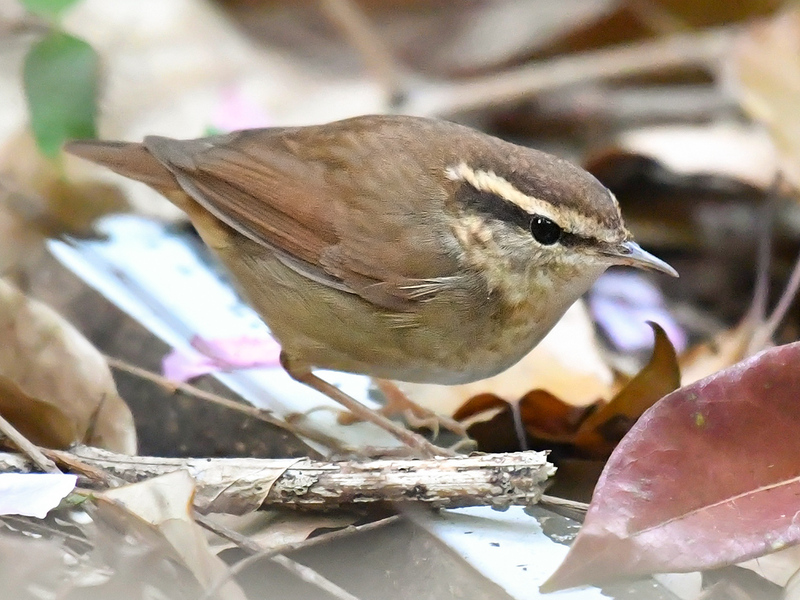 Round’s e-mail message was originally cited in the shanghaibirding.com post “Pale-legged Leaf Warbler & the Shanghai Big 5,” published 26 Sept. 2016 (accessed: 12 April 2019). Yap, F., Yong, D. L., Low, B., Cros, E., Foley, C., Lim, K. K. & Rheindt, F. E. 2014. 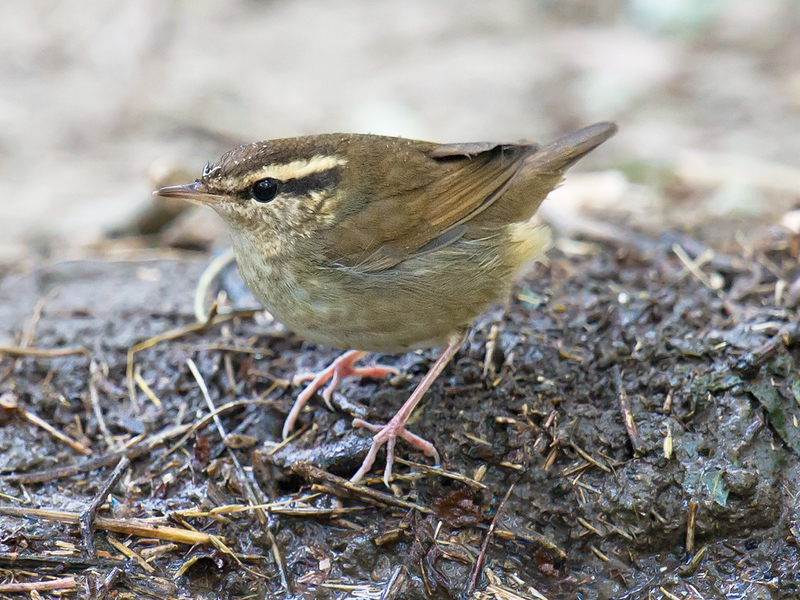 First wintering record of the Sakhalin Leaf Warbler in South East Asia, with notes on vocalisations. 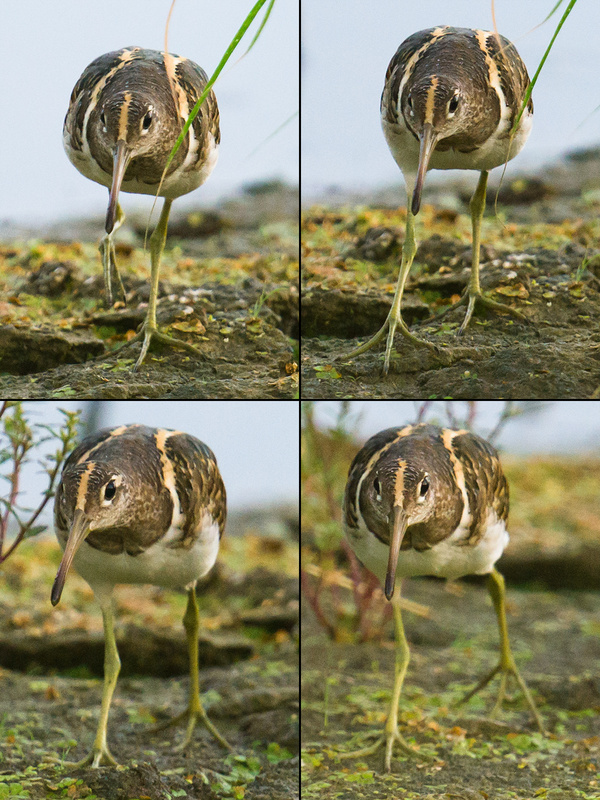 BirdingASIA 21: 76–81. Featured image: Sakhalin Leaf Warbler Phylloscopus borealoides, Cape Nanhui, Shanghai, 17 Sept. 2017. Craig Brelsford photographed and sound-recorded this individual, getting a rare record of the poorly known species in Earth’s Greatest City.